I said farewell to my cousin and took the train to Paris. The first part of the train ride was at conventional speed. The train took a detour north to hook up with the completed stretch of the TGV Est high-speed rail line. The 300 kilometres (186 miles) of track already built between Paris and Baudrecourt in Lorraine are the first section of a 1,500-kilometre (932 miles) European railway line intended to link Paris, Strasbourg, Stuttgart, Munich, and Vienna. When completed, the journey time from Frankfurt to Paris will be 3 h 45 m instead of the current 6 h 15 m. It is not the fastest line in Europe, with a current speed record of 547 km/h (339 miles per hour). While I rode it the commercial speed was 320 km/h (198 miles per hour). When planning your itineary you should consider that most Paris attractions are closed at least one day a week - often Monday or Tuesday. 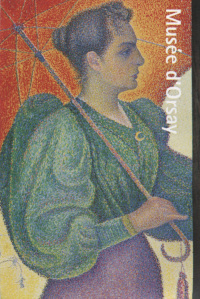 I noted that the Musée d'Orsay was open late on Thursday nights - that gave me time to reach Paris, take a taxi to my hotel, then get over to the d'Orsay to look around. I personally don't like lugging my suitcase around on the Paris Metro - I take a cab. When leaving town, you can have the front desk call for a ride to the airport and one of the van services will pick you up and drop you off at your airport gate. 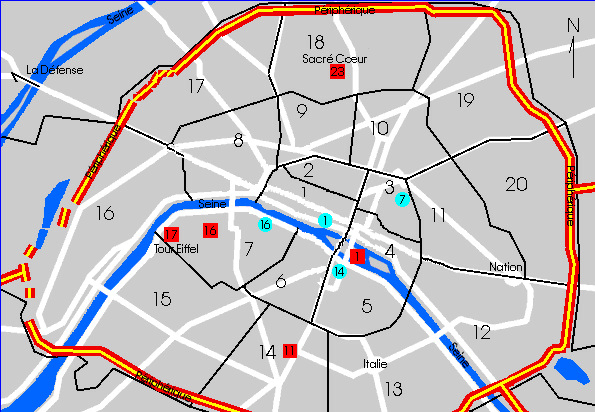 On the map above, I am staying very near symbol blue14 on the map, and the Musée d'Orsay is symbol blue16. I walked there, but you can easily take the Metro. 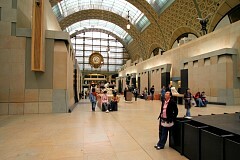 The Musée d'Orsay musée is housed in the former railway station, the Gare d'Orsay. It holds mainly French art dating from 1848 to 1914, including paintings, sculptures, furniture, and photography, and is probably best known for its extensive collection of impressionist masterpieces by popular painters such as Monet and Renoir. 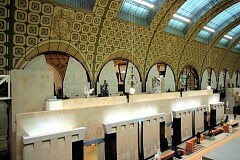 Many of these works were held at the Galerie nationale du Jeu de Paume prior to the musée's opening in 1986. 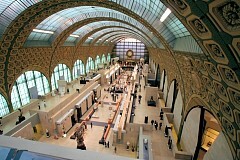 The musée building was originally a railway station, Gare d'Orsay, constructed for the Chemin de Fer de Paris à Orléans and finished in time for the 1900 Exposition Universelle. As technology changed it was used less and less, its hotel closed, and finally was converted into a meuseum December 1, 1986. 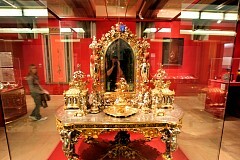 View in a side gallery. I like the detail in various items, and who paints a portrait with the subject turned away? M. and Mme Gaudibert of Le Havre were the generous and understanding couple who came to Monet's rescue in a year of cumulative misfortunes. His family disowned him because of his association with Camille by whom he had a child. 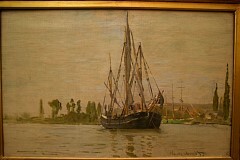 None of the pictures he sent in the spring to the International Maritime Exhibition at Le Havre was sold and the canvases were seized by his creditors. In the summer, together with Camille and the child, he was thrown out of the lodgings he took at Fécamp. He came near to suicide. The order for portraits of the Gaudiberts and their purchase of other pictures by Monet tided him over the worst of his difficulties for a time and enabled him to resume the painting he had almost abandoned in despair. Chasse maree a lancre (chasing the tide at Lancre) date ? Monet is considered the leader of the Impressionist school of painting. In contrast to the almost photographic details in the dress, the rose, the table edge, the carpet, etc. 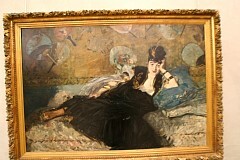 in his painting of Madame Gaudibert (above), note in this painting you can pick out what the items are even though they are fuzzy or an "impression" of what the item is. Some of the trees, for instance, look more like spears of brocali than trees. I also like what he did with the sky - I think it's a good representaion of and overcast day. You can imagine a couple of long trains stretched out under this canopy of this former railroad station. I have to believe the patterned wall decorations were not part of the old station. I think the painting depicts a line between formal portraiture and Impressionism. There is a medium level of detail in this picture, but when you try and focus on the minutae it's not there. If this person is Nina de Callias, she was a wealthy and ran her own Paris salon. I liked that behind the blue dancers are gold/yellow dancers. So to be quite precise, the picuture is about the blue ones and not the others. I find the distinction slightly humorous. I just like the implied "hurry" of the figures as they straighten themselves before going on stage. Absinthe mixes wormwood and other herbs with alcohol to create a 136 proof drink. It was nicknamed, "la Fée Verte", which means the Green Fairy. Although it is sometimes mistakenly called a liqueur, absinthe is not bottled with added sugar and is therefore classified as a liquor or spirit. Eventually, absinthe was portrayed as a dangerously addictive, psychoactive drug. 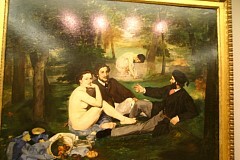 I just liked the body language of the two people in the painting. While the glass on the left looks like it could be absinthe, the glass on the right does not. 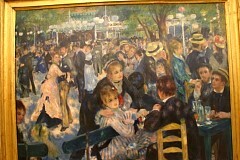 Renoir's early works were typically Impressionist snapshots of real life, full of sparkling colour and light, which this particular painting is an example. I like the number of couples and individuals you can pick out of the crowd. This just caught my eye as the example of what must have been considered the perfect female form at that time. Van Gogh painted something like 35 self-portraits. I like the electric-jangled brush strokes. Van Gogh always identified with the peasant class and, one could argue that he was at his most happy and fulfilled when he shared in their experience. Van Gogh began doing studies after Millet works as early as 1880. The profound influence of the work of Jean-François Millet (1814-1875) upon Vincent van Gogh cannot be overstated. These early studies helped Van Gogh to learn the disciplines necessary in order to paint. 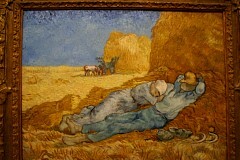 Van Gogh, like Millet, viewed farmers and labourers as truly noble people and this is clearly reflected in his works. At ages 13 and 14 Henri fractured both his thigh bones. The breaks did not heal properly. His legs ceased to grow, so that as an adult he was only 4 1/2 feet tall. He was declared to be "The soul of Montmartre", the Parisian quarter where he made his home. He often portrayed life at the Moulin Rouge and other Montmartre and Parisian cabaret and theaters, and, particularly, in the brothels that he frequented avidly. He would sit at a crowded nightclub table, laughing and drinking, meanwhile making swift sketches. The next morning in his studio he would expand the sketches into brightly colored paintings. In this painting Lautrec shows the female dancer La Goulue performing the scandalous chahut (can can) with her loose-limbed partner Valentin Le Désossé (the boneless). The seemingly physically impossible depiction of the male dancer is what caught my eye in the first place. I liked the treatment of the dress. My own daughter wore a folded similarly-colored dress like this to prom last year, too bad 'od PA couldn't paint her. I passed an outside window, and as you can see if you enlarge this, the sun is setting behind the Eeifel Tower. Tres bon. 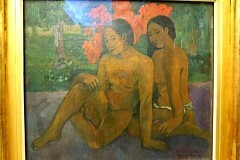 From 1891 he lived and worked in Tahiti and elsewhere in the South Pacific, which is clearly where this subject matter comes from. This is Neo-Impressionism, where objects have taken one more giant step into abstraction than does original Impressionsism. Let's see, we have the beach, lunch, and naked women all in fresco style. I don't care much for statuary, but they have some of it here at Musée d'Orsay. When I first glaced at these works by Bonnard, I thought to myself, "Bonnard's entire stylistic evolution offers a transition from impressionism to a coloristic, abstract art." Really. Note the cats on the bed in the picture on the right. Perhaps it should be titled, "L'homme and et la femme et des chats"? Aristide Maillol played an important role in the development of sculpture, using the female form as his primary vehicle, so this painting seems out of the scope of his normal area. I like it's simplicity: the sky, the water, the land, the path, and the young woman with the frowning expression. 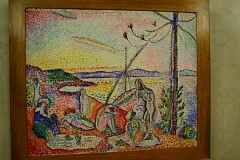 His theories contributed to the foundations of cubism, fauvism, and abstract art. 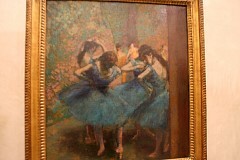 The subjects of his paintings included landscapes and figure studies, particularly of mother and child. This picture caught my eye - would a group of men in this same pleasant, hot setting with a small child in their midst just start peeling off their clothes?